Primary One application result has already been dispatched to ALL applicants BY POST on 12th November, 2018 (Monday). If you have NOT received the result yet, please notify the school by phone during office hours from 15th to 20th November, 2018. Registration procedure will be conducted for successful applicants on 28th – 29th November, 2018. Applications for admission are accepted twice a year. Application form can be downloaded from the School Website. 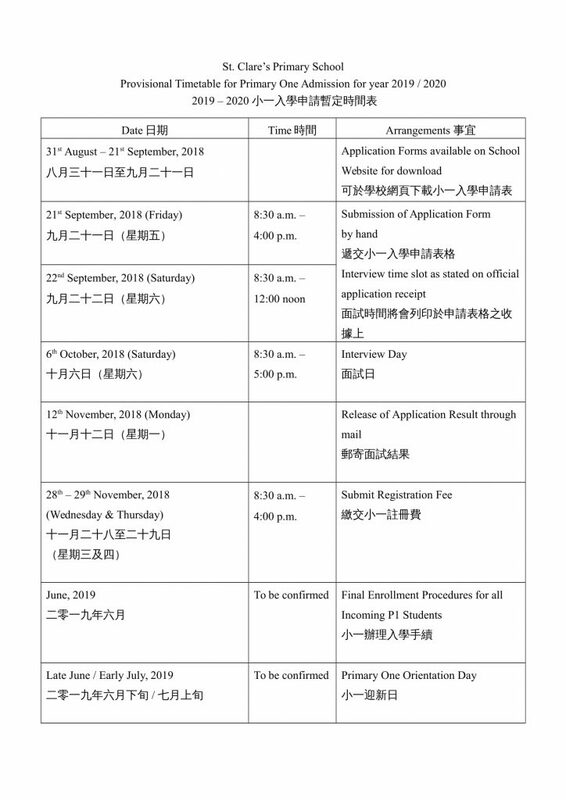 Please submit the completed application form and documents required by post on or before the deadline stated below. Documents submitted should be arranged in the following order. Please clip the documents at the top left hand corner. Do not put them into any file or clear folder. e. For applications who wish to submit reference materials, please note that only paper documents will be accepted (A4 paper, ,maximum 5 double-sided sheets). Please do not hand in CDs, clear folders etc. The application fee is $50 per applicant per application, to be settled by cash when the applicant is invited to an interview. This is a non-refundable, non-transferable fee. The collection of this fee does not constitute any assurance that a school place will be offered. The School will not be able to invite all applicants to the interview and entrance test. Only applicants demonstrating sufficient academic skills to engage with the curriculum will be invited. Final selection will be based on the applicant’s performance in the interview and entrance test. Successful applicants will be notified by telephone. If you do not hear from us within one month from the application deadline, you can assume that your application is unsuccessful. Applications will have to be filed in again for those who are interested to fill seats for another school year. The annual tuition fee for 2018/2019 is HK$41,000 per annum, payable in 10 installments. NOTE: To implement the all-graduate teaching force policy in the 2019/2020 as stated in the Chief Executive’s 2018 Policy Address, the school needs to increase the remuneration for the teaching staff in order to maintain a high quality teaching force, so the school fee for Primary One 2019/2020 will be further adjusted to HK$46,000 per annum, pending approval from the Hong Kong Education Bureau. An application with insufficient supporting documents will not be processed. The school reserves the right to withdraw the offer of a school place should any information provided be found to be untruthful or inaccurate. The primary school has a Fee Remission Scheme to enable needy students to continue their education in our school. A policy is set up to ensure fairness in processiong and sclecting successful applicants under the criteria laid down by the Fee Remission Scheme. Fee remission is offered by the School Sponsoring Body - Missionary Sisters of Our Lady of the Angels. Students who apply for fee remission should obtain the Application Form from the Class teacher. Application Forms are available from September of each new school year. Completed Application From with necessary supporting documents must be submitted to the school. A Letter of Notification will be sent to the individual applicant to inform him/her of the application result within three weeks from date of complete submission of documents. The School reserves a final discretion as to whether to grant a fee remission.